A native of Tokyo, Hirai graduated from the School of Visual Arts in New York in 2000. After returning to Japan in 2001, he was active as an artist, producer, interpreter, and editor and worked as a freelance writer under the name Yuta Man. 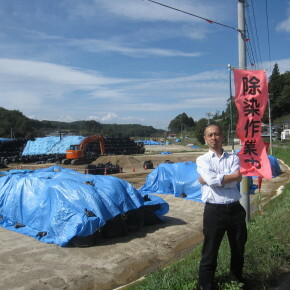 Since the March 11, 3011 disaster, he has commuted regularly to Fukushima to support the recovery effort and in October 2012 has worked in the office of the “Soil Screening Project” in progress through collaboration of local agricultural and consumer cooperatives along with Fukushima University. He is co-author of No no saisei to shoku no anzen: Genpatsu jiko to Fukushima no ni-nen [Revival of Agriculture and Food Security: Fukushima Two years After the Nuclear Power Plant Accident] (Shin Nihon Shuppan, 2013). at Yamakiya district, Fukushima city.